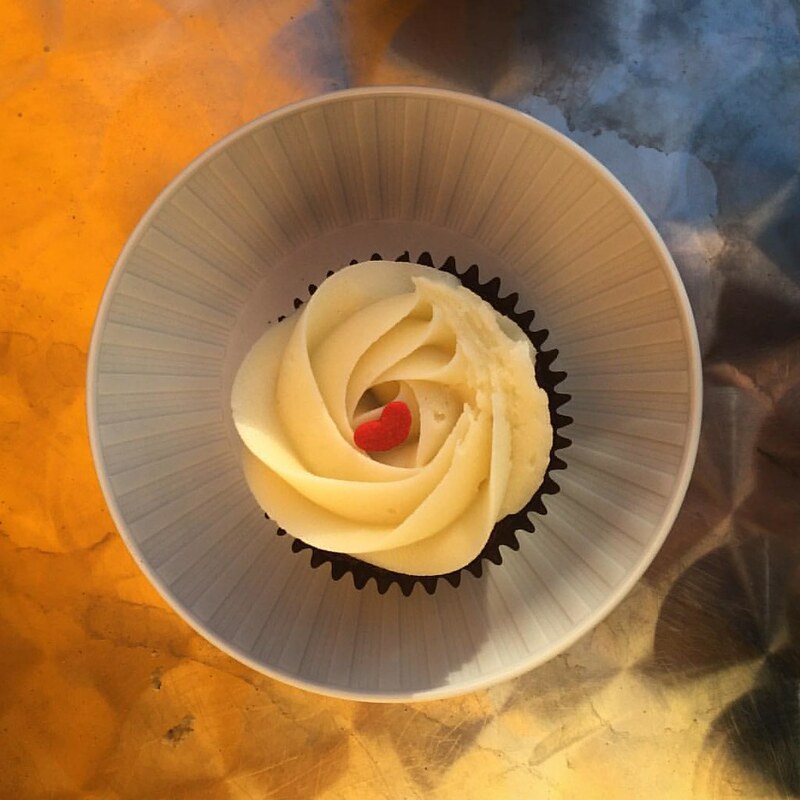 I hate my birthday – it’s a reminder that I’m getting old. Rather than stewing in annual misery, I decided to do something about it. My birthday would be the perfect opportunity to bike a century (100 miles). A Birthday Century! I’m a city cyclist. A typical ride for me is a Sunday jaunt around DC, with a requisite stop for coffee. Decidedly not a MAMIL (a middle-aged man in lycra), I don’t have clip-in pedals, bike shoes, a trip computer or any of the other accoutrements of the serious cyclist. Instead, I have a ten-year old Specialized Sirrus that I call Bikey. With little more planning than filling up a water bottle, I set off early on May 31. Destination: the end of the WO&D Trail in Purcellville. I like Best Buns. I cannot lie. With hours of biking ahead of me, I decided to fuel up with a massive pastry from this Shirlington bakery. Rolling up after crossing the river from DC, I saw bikes and a couple of bike people that I recognized. It was the Hump Day Coffee Club, a meetup of Northern Virginia cyclists. 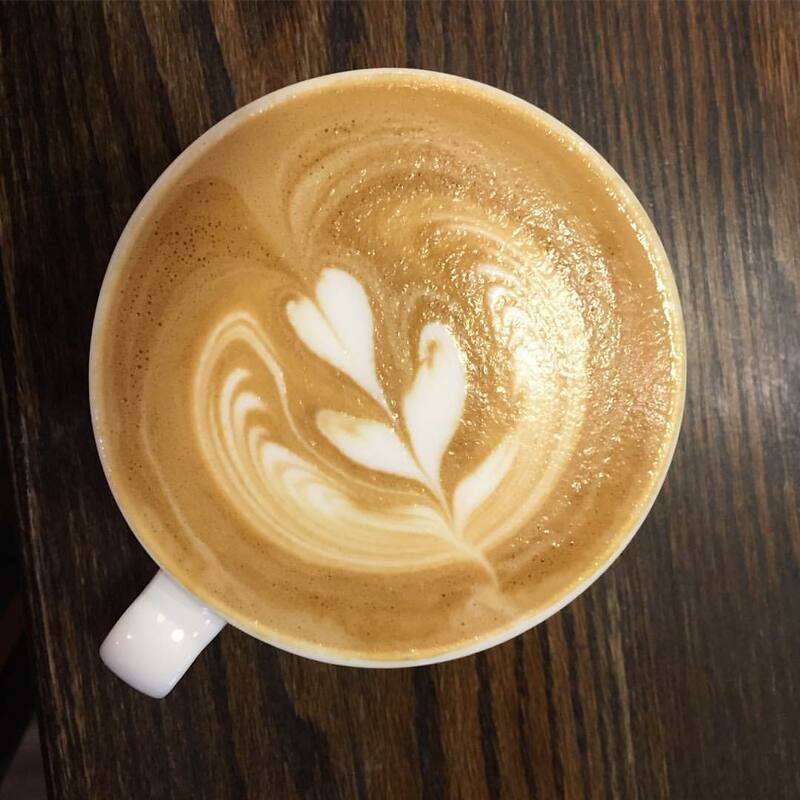 There are coffee clubs around the region, including a Friday Coffee Club that I occasionally attend at A Baked Joint. It’s a chance to meet other bike riders, swap notes about commuting routes and plan future rides. I proudly told them of my plan to bike to the end of the WO&D, as if I was Magellan about to set out into the unknown. One of the coffee klatch casually tossed out that she had done the whole trail herself, on a whim, when she got a new road bike for her 60th birthday. Suitably shamed/impressed, I set out from Shirlington, following Four Mile Run until it connected to the WO&D Trail. A long day of biking stretched ahead. 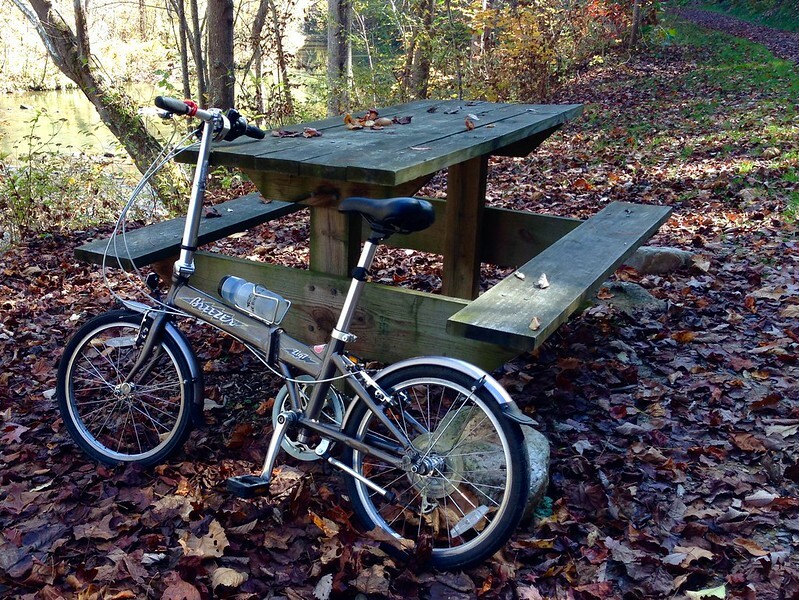 Twenty miles later, as I biked through Reston, I heard a shout. It was one of the coffee club members, passing me, with a friendly hello. As I rode my century, I tweeted and shared photos using #abirthdaycentury. In return, I received suggestions and encouragement from other #BikeDC cyclists on Twitter and Instagram. 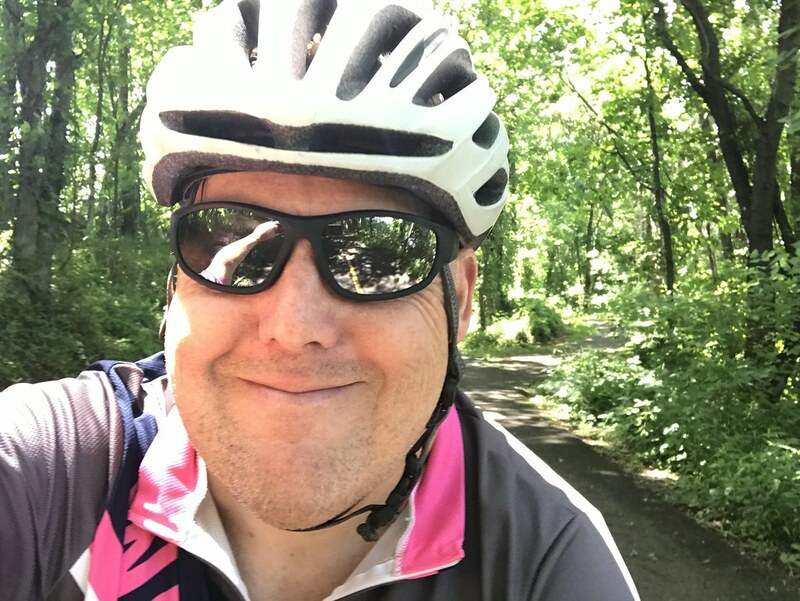 Though I might find myself in a dark wood, in the middle of my journey (like Dante), I never felt alone because of the BikeDC community. Instead, I felt like I was part of a small town on wheels, a rolling community of cyclists that exists on streets, trails and in cyberspace. My plan was to get as far down the trail as possible without stopping. I knew that each time you stop, it’s harder to get back on. 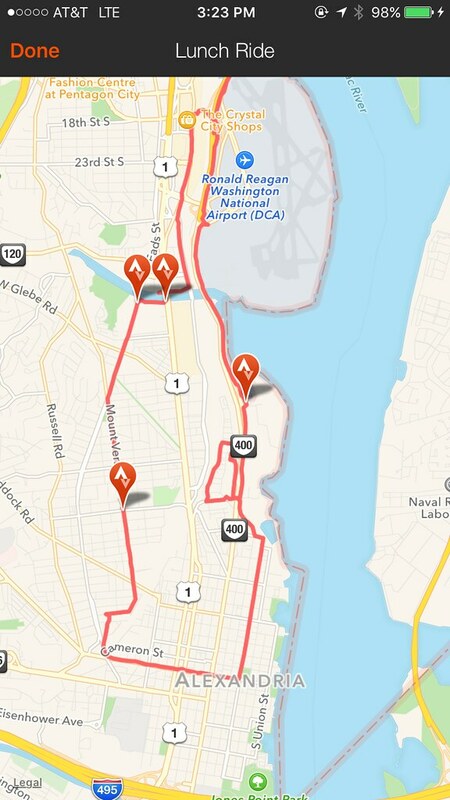 So, I kept going, the towns going by every few miles – Falls Church, Vienna, Reston, Herndon, Ashburn. I reached Leesburg around noon. Eat here or keeping going to Purcellville? I had packed a single Clif bar so I ate that, before beginning a four mile ascent through Clark’s Gap and over the low range of green hills that I’d been watching since Reston. 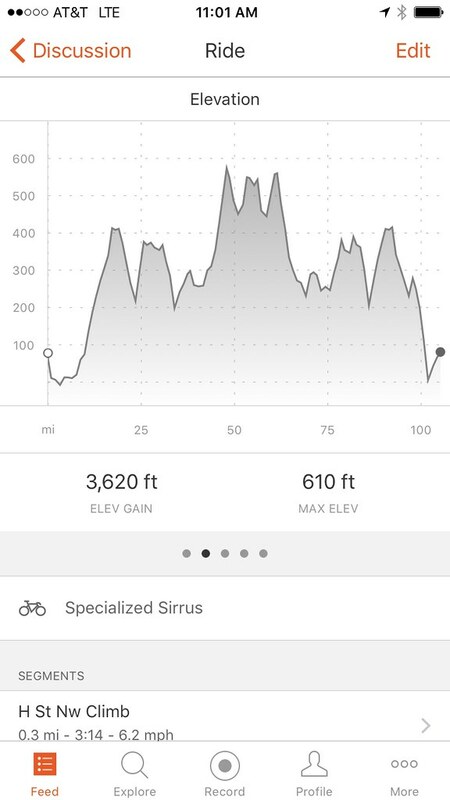 The elevation profile tells the story. Doesn’t seem a lot but it was enough to wipe me out. This was the hardest part of the ride, 45 miles in and a climb to the highest point on the trail on an empty stomach. But this was not enough. I could’ve fit in a whole other meal and not been satisfied. 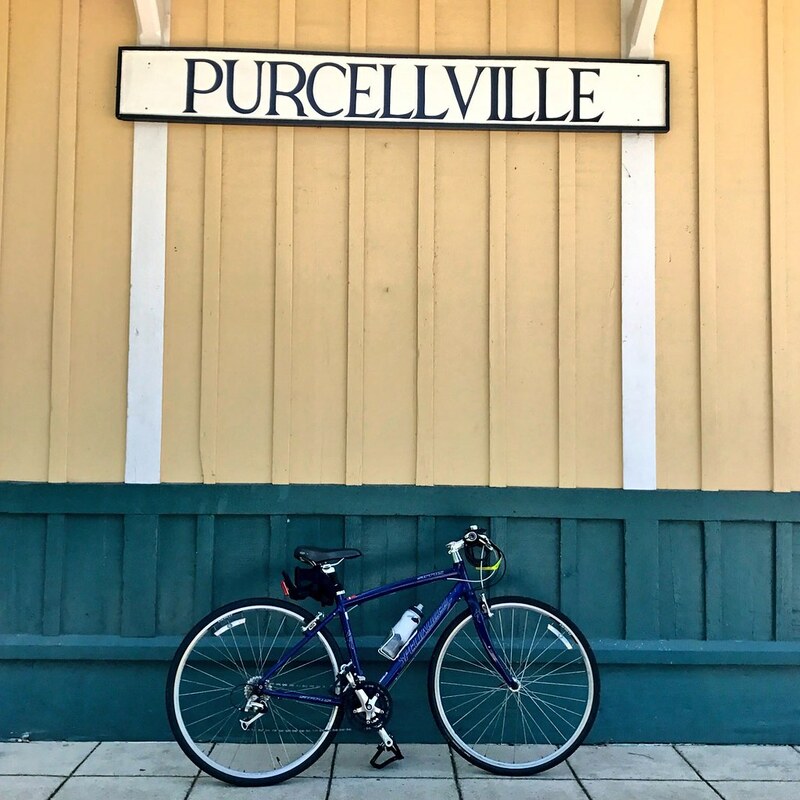 I felt sense a tremendous sense of accomplishment seeing the end of the trail and the iconic Purcellville train station, photos of which I had seen in the Instagram feeds of countless #BikeDC friends. Now I had joined them. 55 miles done. I just needed to get back. 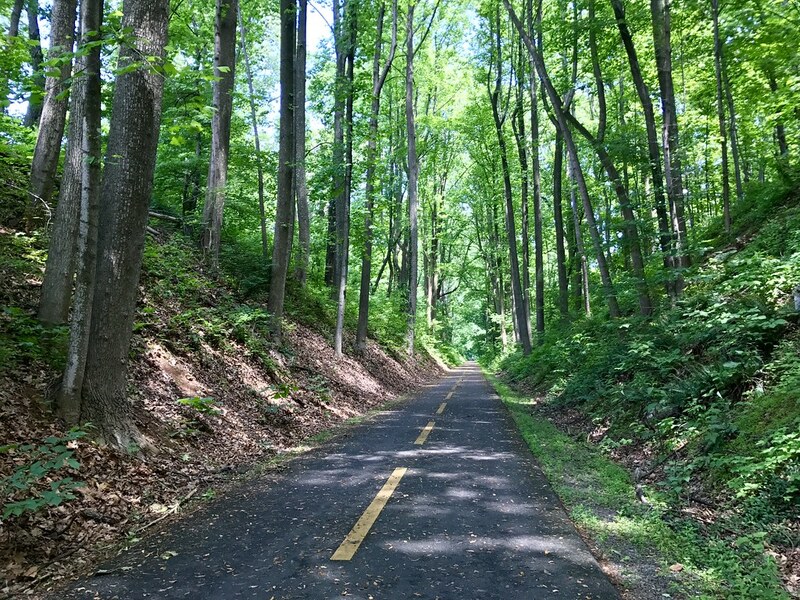 Thankfully, it was mostly downhill, providing me the opportunity to enjoy a gorgeous ride through the woods back to Leesburg. Then I went back through the towns I had passed earlier, like a film being rewinded. Leesburg, Ashburn, Herndon. Local biking legend Mr T in DC suggested on Twitter that I stop for a smoothie at Green Lizard Cycling so I did. It was delicious but I needed more food. The day before, Northern Virginia had been hit by a line of severe weather, possibly including a tornado. More storms were expected. As I biked back, I noticed the puffy clouds gathering behind me, chasing me back to DC. Rolling into Vienna (almost home! ), the skies grew dark and I felt the first patter of rain. I decided to duck into Whole Foods as a thunderstorm swept the region. I bought some Clif bars and waited for the storm to pass. It was a big one, with hail in Reston (which I had just gone through). Rain won’t kill you. But lightning will. You should respect the weather. After the rain was mostly done, I resumed my journey on a jet-black trail with steam rising off it. I was going to write that gear doesn’t matter. After all, I did a 105 miles on an outdated hybrid bike with an even more outdated human. But gear does matter. Without padded bike shorts, I wouldn’t have been able to spend all day in the saddle. 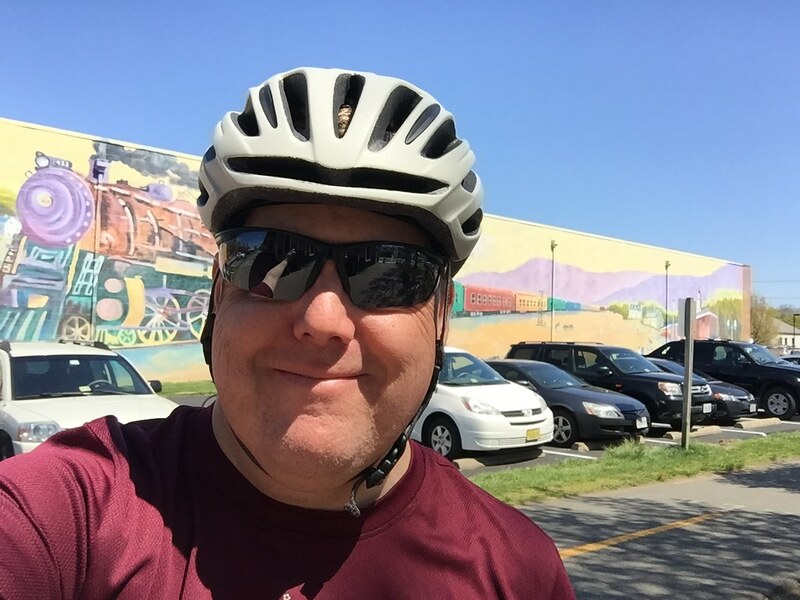 A bike jersey with a ventilating zipper kept me cool in the stuffy weather. Gloves enabled me to hold on to handlebars slick with rain. Riding back after the storm, my backside grew damp, as my wheels kicked up water and grit from the trail. Fenders! Why don’t I have fenders? And as much I love Bikey, a road bike or even a newer hybrid would’ve made the century faster and in more comfort. Gear matters. Of course, you can bike without bike shorts, a jersey, gloves or, hell, even a water bottle but those basics make biking easier. 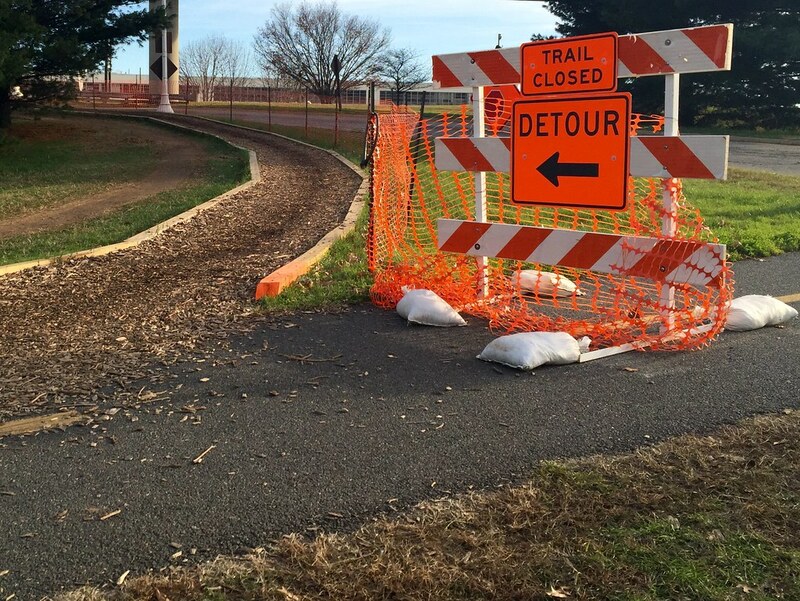 I took the Custis Trail back into DC, a roller coaster ride, going up and down overpasses all the way into the city. I was hungry, and moving, flying down the descents as the sun emerged over the Washington Monument. 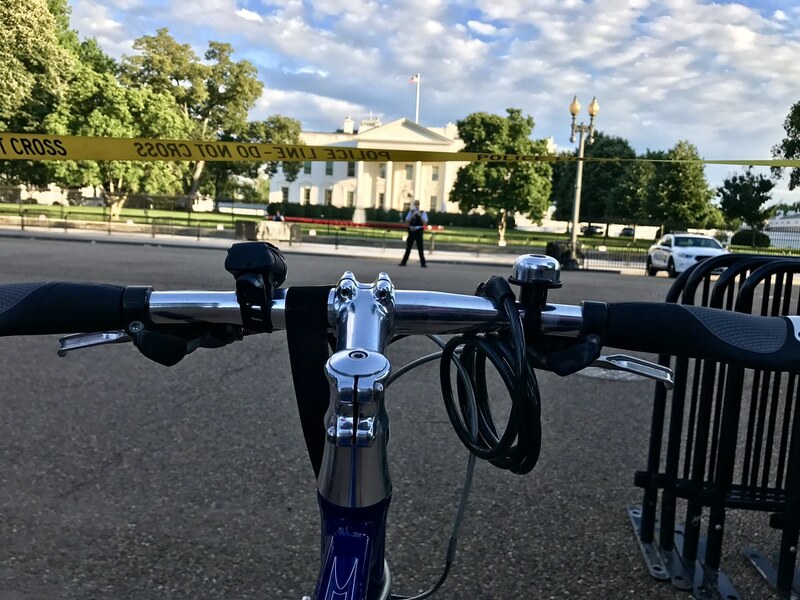 I wanted to get a picture in front of the White House but, of course, the Secret Service had it blocked off. I settled for a photo from behind the yellow tape. Welcome back to the security theater of Washington, DC. 105.1 miles in nine and a half hours, according to Strava. But numbers don’t tell the true story of a Birthday Century. It wasn’t the miles biked or the hours in the saddle that was important. Instead, like any journey, it’s the lessons learned along the way. Washington is not The Swamp. Nor is it House of Cards. And it’s certainly not the sleepy burg with a couple of cool restaurants that The New York Times rediscovers every few years. 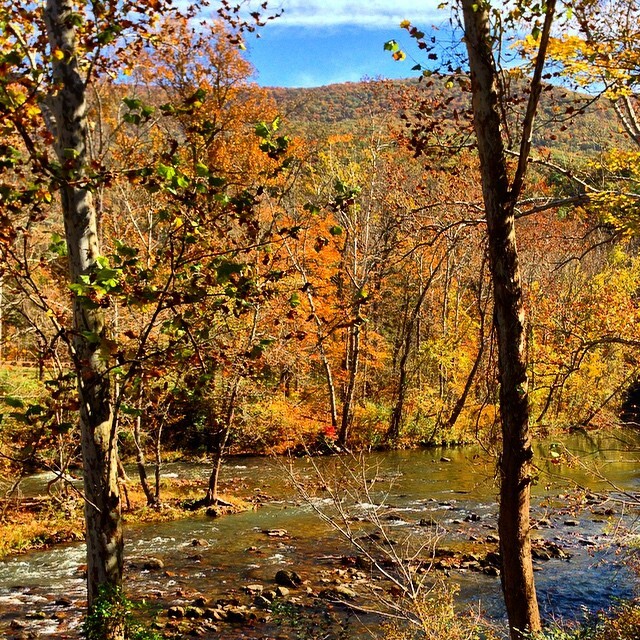 Instead, it’s something different – a sprawling urban corridor that stretches along I-95 from Richmond to Baltimore, from the blue waters of the Chesapeake to the green forested Appalachians. More than just the nation’s capital, it’s six million people in a megacity that dominates the Mid-Atlantic. Saturday, while the cherry blossoms were blooming along the Tidal Basin, I crossed the river and went to Artomatic. 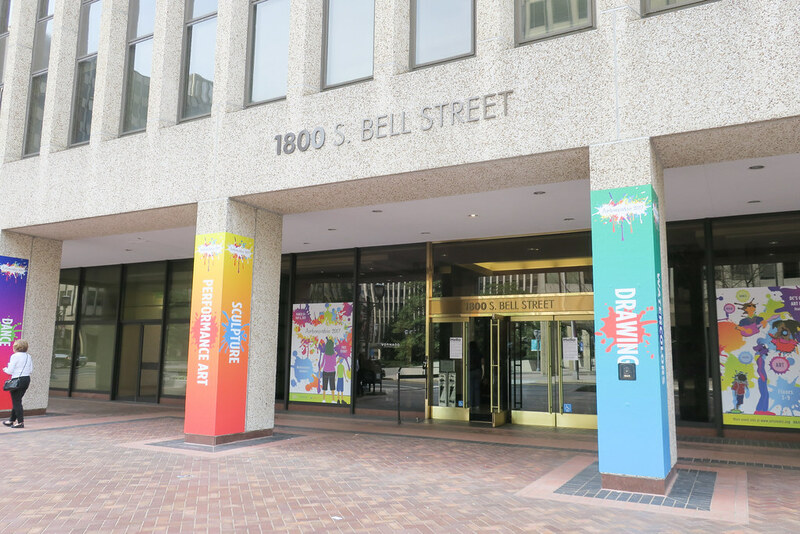 More than 600 artists, performers, musicians, and creatives of all stripes have converged upon Crystal City for this massive art festival that runs from March 24 – May 6. Artomatic is seven floors of art, along with classes, performances and movies, all taking place in an empty office building just across the Potomac from the capitol. Admission is free. Artomatic is a non-juried festival. Anyone can participate. 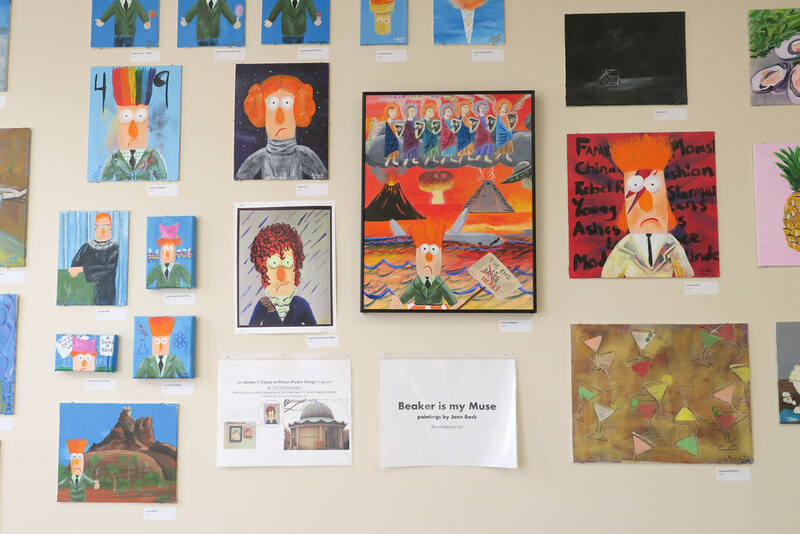 Artists that pay a fee and agree to do some volunteer time get space to display their work. Which means that you’ll find stuff you love, stuff you hate, and lot of work that falls somewhere in between. It’s always inspiring. And I love to see friends of mine in the show. You’d be surprised at how many artists there are in Washington. Lawyers, web developers, government workers by day, they’re painters, photographers and dancers by night. Artomatic gives them the opportunity to shine. 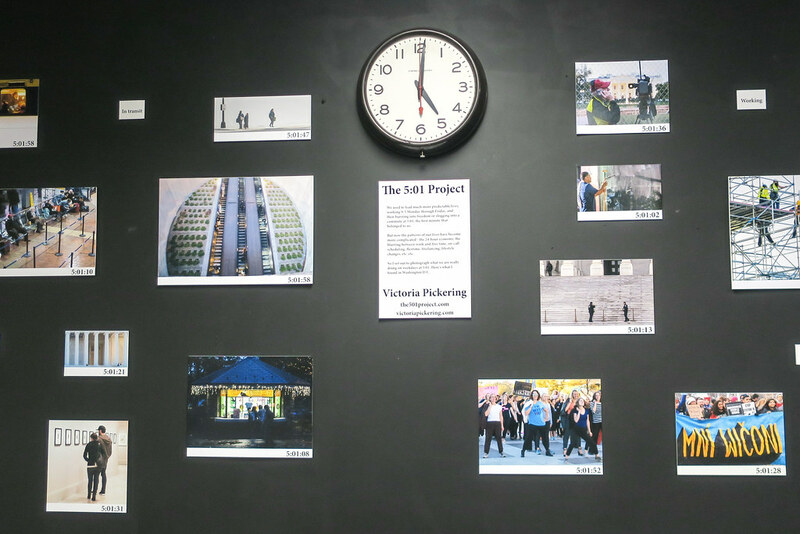 Victoria Pickering took a photo at 5:01 PM every day for this project. Space. A lot of it. Thousands of square feet of space in a building soon to be redeveloped, opened or torn down. Artomatic began in 1999 when a developer donated space in an old building. Artomatic typically takes place in transitional neighborhoods, where space is being converted from use to another. Military offices have moved out of Crystal City and their space is being redeveloped. Artists. A lot of them. The 2008 show featured 1,540 individual artists, including painters, sculptors, photographers, dancers and poets stretched over ten floors in a new office building in NoMa. 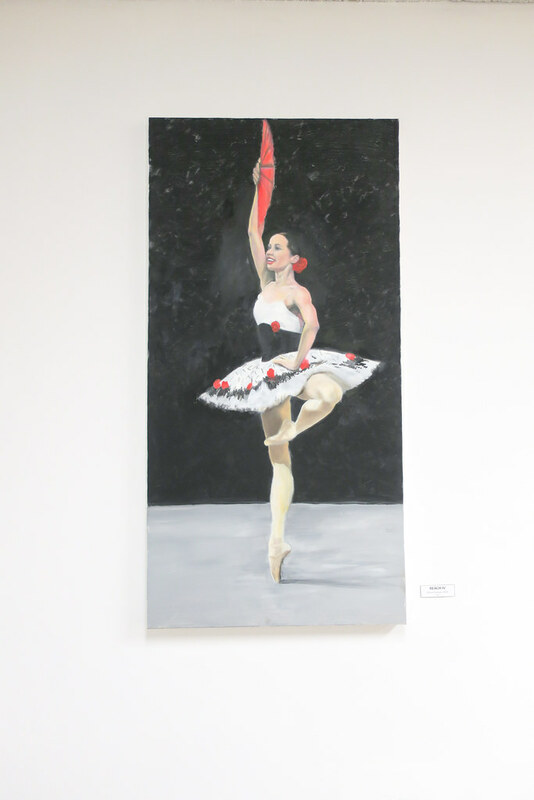 The artistic community is large in the region, featuring moonlighting professionals as well as graduates from local universities. Audience. The memorable 2008 edition of Artomatic hosted the biggest audience ever, drawing 52,000 people. When I visited on Saturday, the halls were full of friends and family of the artists, as well as the culturally curious, drawn to see something new. Organizers. Artomatic ain’t easy. The festival requires talented event planners to acquire the space, recruit volunteers and manage the event. Smart, well-organized, Type-A people, something DC specializes in. Only in DC will you find this combination of arts, audiences and organizers. Washington isn’t the city you see on CNN. It’s more than just marble columns and endless arguments. Artomatic demonstrates the creative power and vibrancy of a city that few in America truly know. High Bridge is more than 2,400 feet long and 125 feet above the Appomattox River. Bikes mean business, drawing visitors to lesser-known regions that they otherwise might speed by on the interstate. Prior to tonight’s Vice Presidential debate, who had heard of Farmville, VA? It’s a town hours from anywhere. 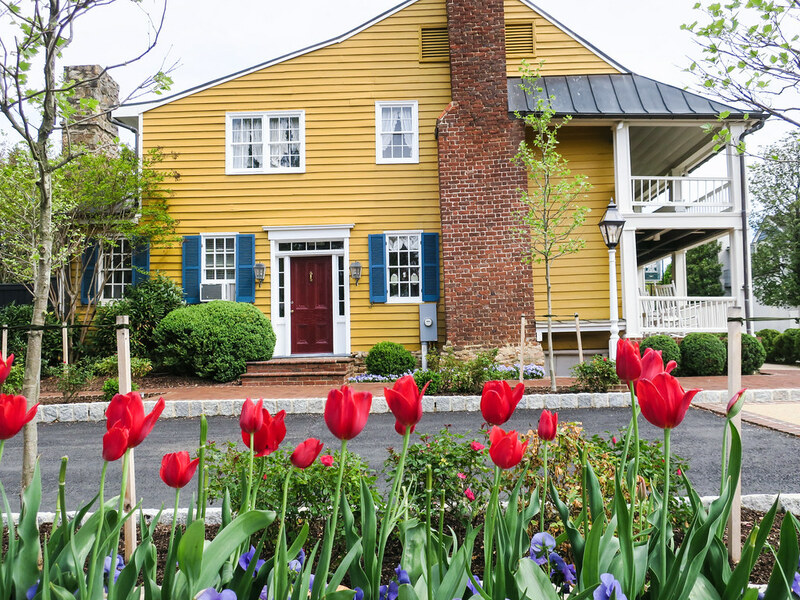 Located on the path of Lee’s retreat from Richmond, it might be of interest to Civil War buffs but most people would find no reason to visit this sleepy burg. Unless you bike. Then you’ve heard of Farmville, for it is located on the beautiful High Bridge Trail, an old rail line that stretches more than 30 miles through the rolling Virginia countryside and crosses the Appomattox River on the aptly-named High Bridge, a historic landmark. The prospect of this vista lured me from Washington, DC. I spent a couple hours biking the trail one rainy morning. I even stopped in the town of Farmville for a bite to eat. High Bridge Trail State Park runs right through the middle of Farmville, VA.
Bike trails like High Bridge are an inexpensive way to bring tourist dollars to your region. In addition to the health benefits, bike trails are also an amenity that keeps people in the area. If you’re a Democrat, you can support bike trails for environmental reasons. Republicans can support them for the economic benefits. 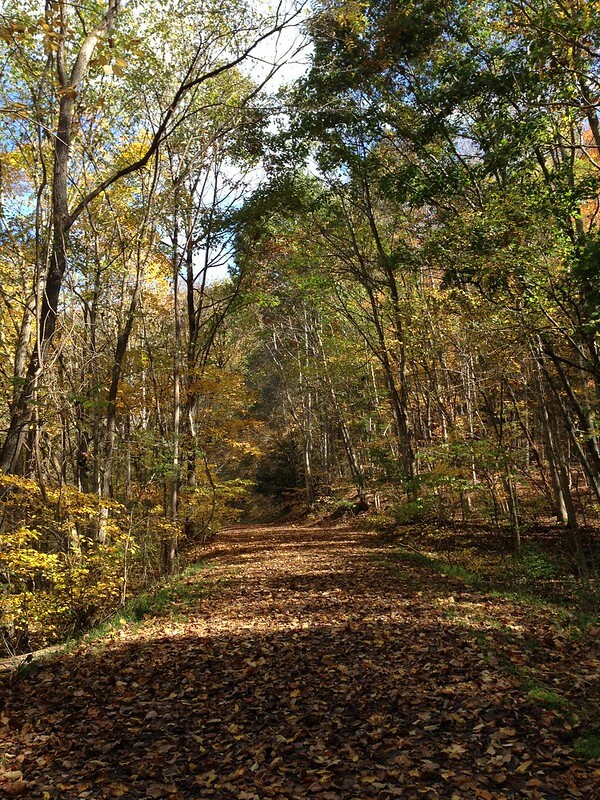 Will the VP candidates be asked about nearby High Bridge Trail at tonight’s debate? Doubtful. Which is unfortunate, because the spread of bike trails is something that both parties can agree upon.